For our girly glam farmhouse bathroom makeover, we spent a lot of time shopping online for all our perfect bathroom accessories. Wayfair makes home improvement easy and affordable and we love that they offer fast, free shipping over $49. It’s easy to spend that much being one of the world’s largest online destinations for the home with over 10 million products on site! It was so fun to get a glimpse of what this space will look like after refinishing the vanity! 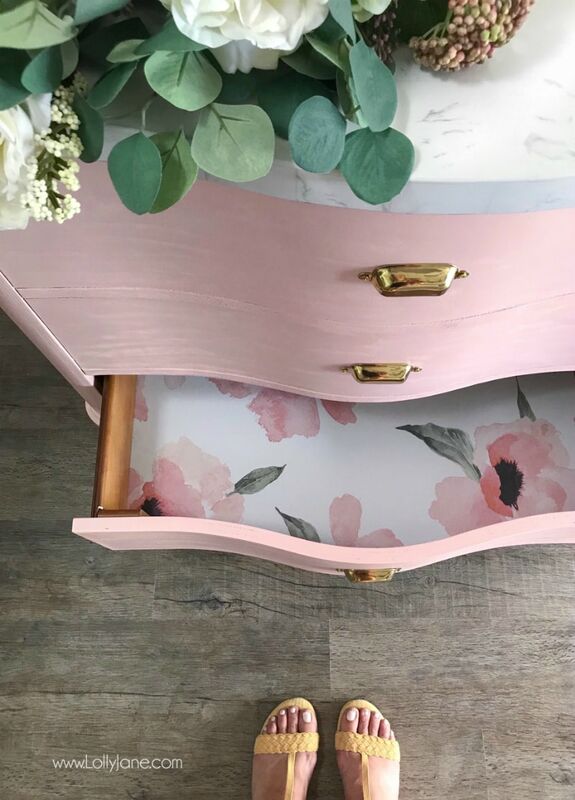 We scored this cute curvy vanity from Wayfair and couldn’t wait to cover it in Behr’s Positively Pink! With the Marquee paint, 2 quick coats covered this vanity easily. We used a semi-gloss sheen for easy cleanup if it gets wet. 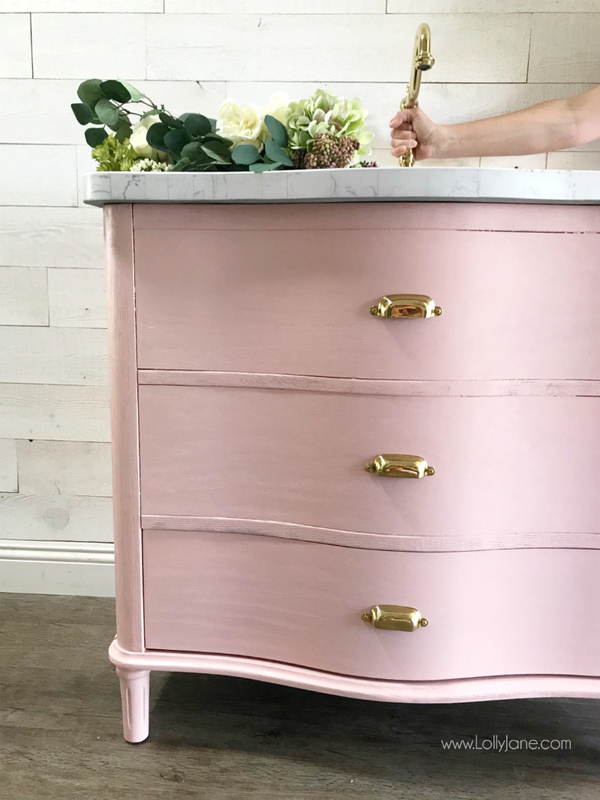 We swapped the original drawer handles with gold cup pulls for the perfect glam farmhouse feel. How about that floral peel and stick wallpaper? It definitely makes the space! We added some as a shelf liner to the bottom drawer to tie the vanity to the room and love how it turned out. UPDATE: Here’s the final reveal of the room! 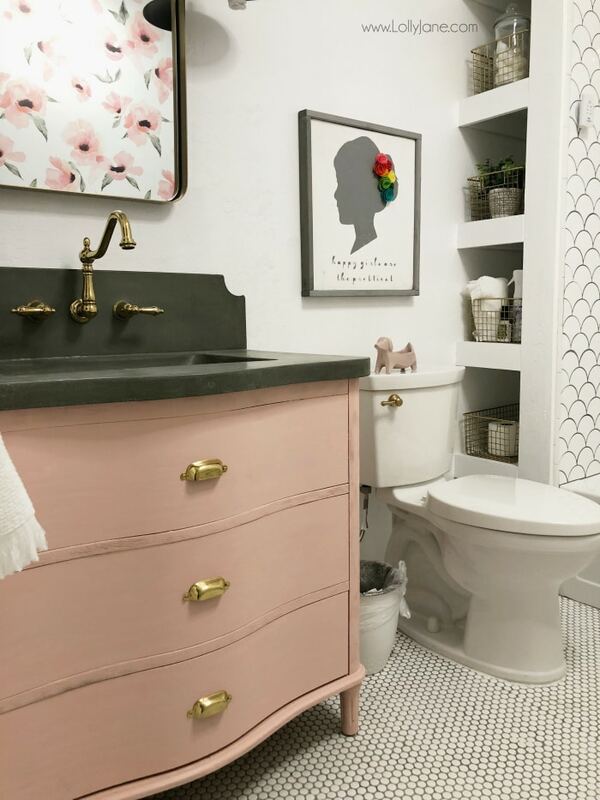 Doesn’t the concrete counter top with the gold faucet look so pretty with the pink vanity? 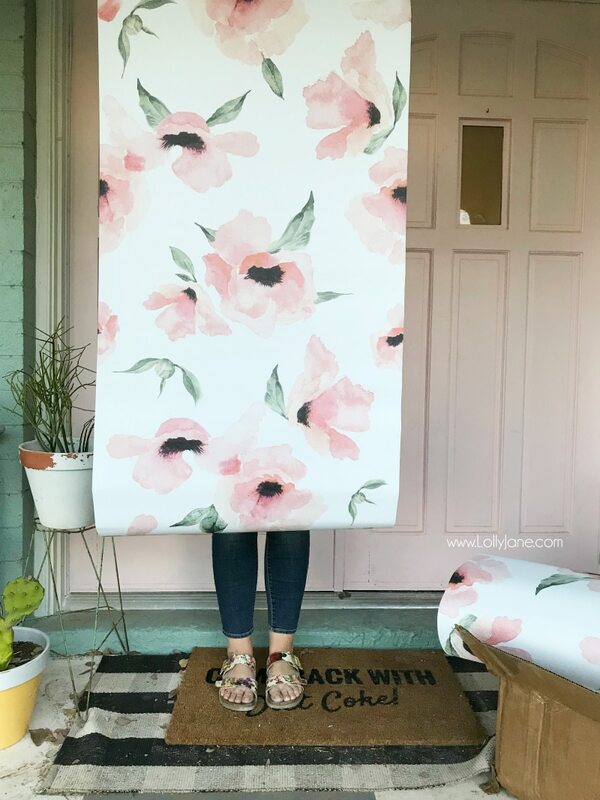 The floral wallpaper turned out so gorgeous, it exceeded our expectations! If you’re keepin up with the Jeffrey Court + One Room Challenge, we’re on week 4! Update: We are officially D O N E with demo mode. HALLELUJAH! 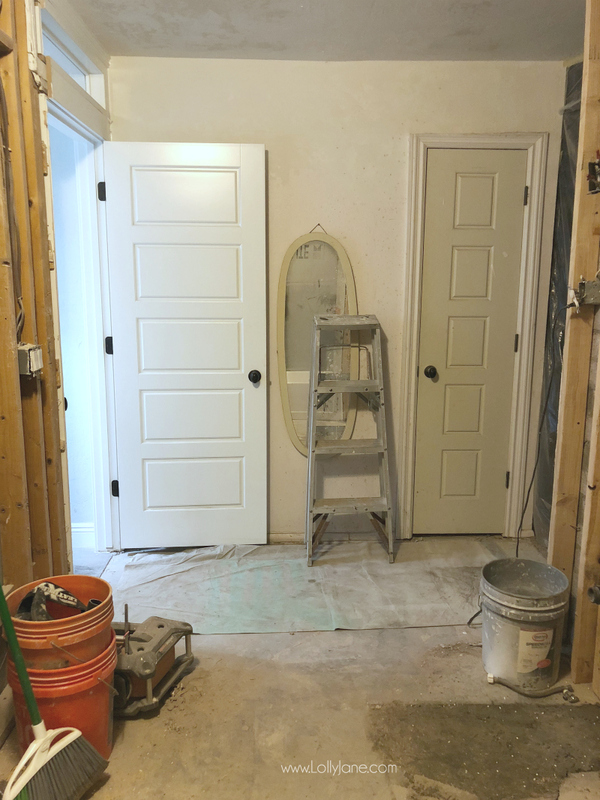 It took us 3 weeks but we had a changing of hands THREE times with contractors…renovation life, I tell you! We brought in some big guns as back up and are finally on track! We covered a lot of plumbing ground, super exciting! NEXT week, you’ll see some H U G E changes. Swearsies! 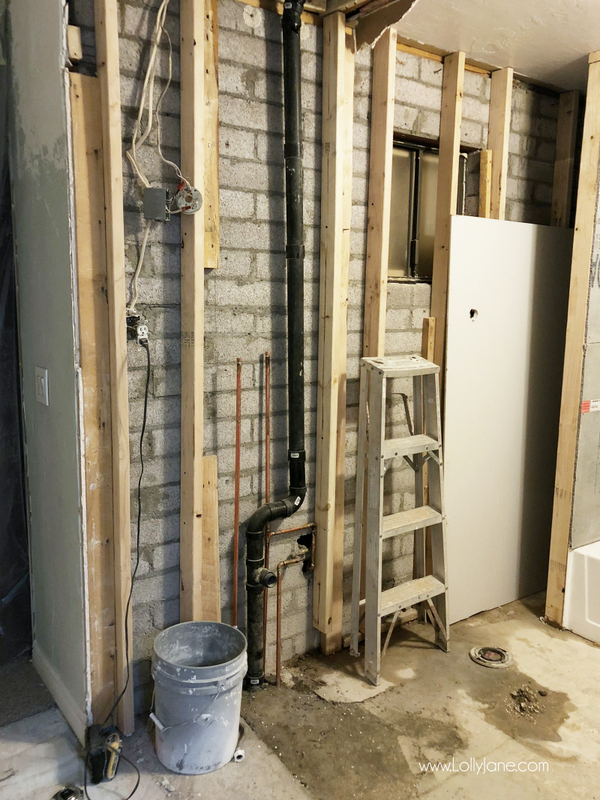 Plumbing moved from the middle of the room into the south wall. 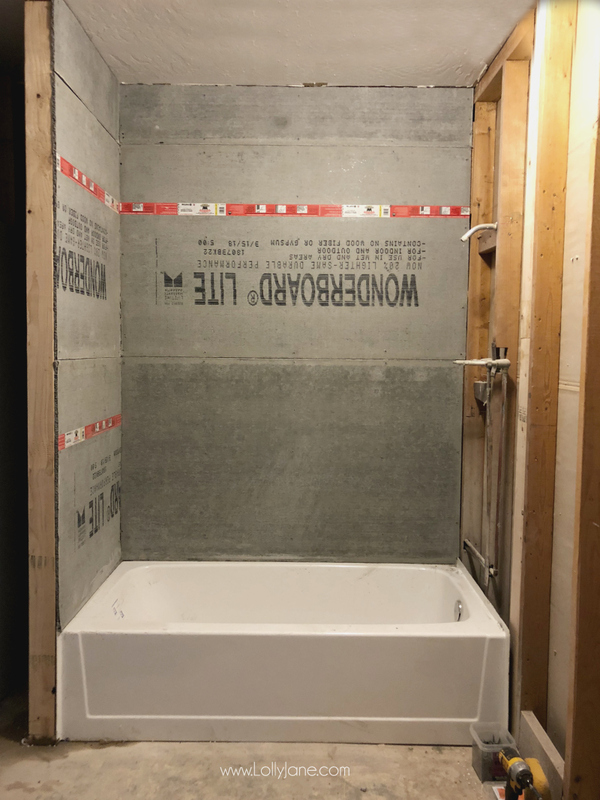 Shower drain moved to accommodate bathtub drain. Toilet plumbed, metal flange replaced. Cement floor holes filled in. Studs installed for 3 new walls. 2/3 of backer board installed. These aren’t pretty updates and we are dyyying that we don’t have aesthetically pleasing pictures to share! BUT these are big changes and we are nearly ready to wash our hallway floors for the first time in a week…they are currently CAKED IN MUD from all the concrete drilling and filling. Our eardrums are dead from the jackhammers and 2×4 studs being installed. BUT it’ll be worth it! 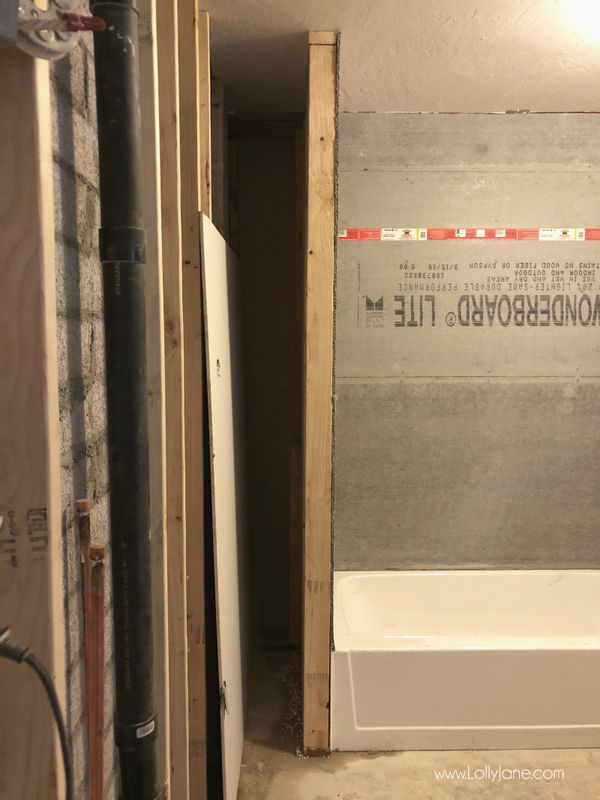 Can’t you just IMAGINE how gorgeous the fan tile from Jeffrey Court will be surrounding the new bathtub? These future built-in shelves are going to add much needed storage and will be cute, to boot! Head to our original inspiration post to see a peek of what they’ll look like next week. This wall still needs the backer board continued (where the shower faucet is seen here). The rest of the wall will then be dry-walled and the floral peel and stick wall paper will cover it. Can’t wait for this pretty floral accent wall to shine! This is the wall that the toilet and vanity will be one. The metal toilet flange was over 40 years old and super rusty. Glad to get some fresh plumbing in to last another 40 years! 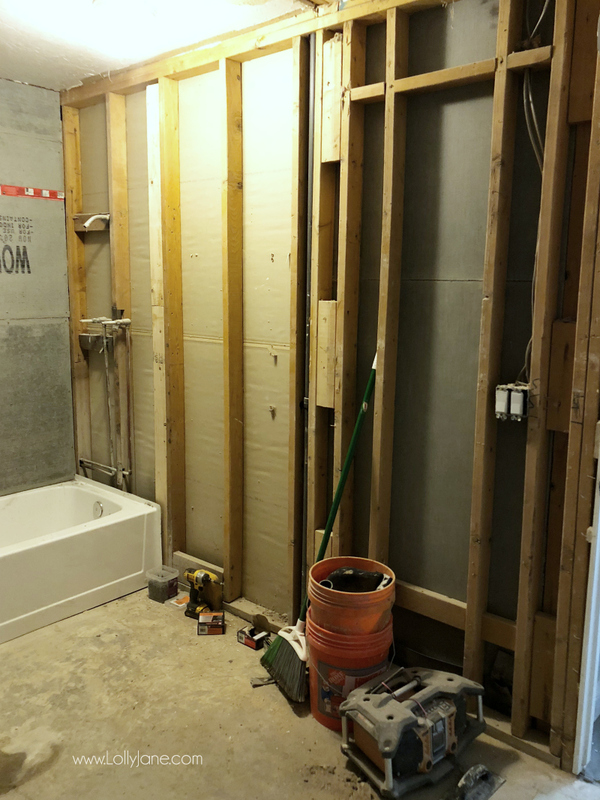 This is the east wall which was never officially apart of the bathroom. It was the hallway entering our bedroom. The original wall across it was torn down so we can see the full wall for the first time. But not for long, the new parallel wall will go up next week making the existing hallway longer and entering into the master bedroom. Where did you find the drawer liners?! ? What’s NOT to love here?!??! 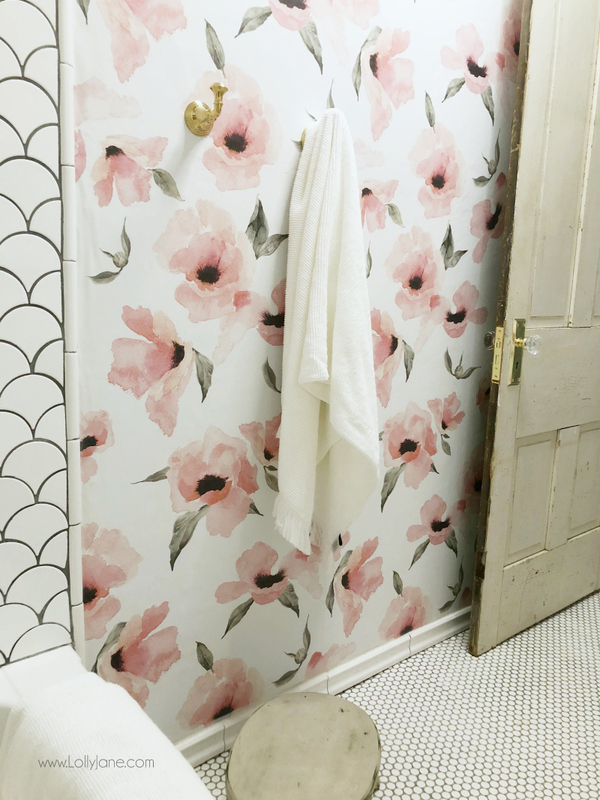 The pretty painted vanity, gorgeous floral paper and beautiful finishing touches…I want this bathroom, now!